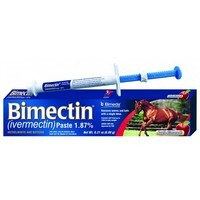 Bimectin Horse Wormer is a ready-to-administer, 18.7mg/g oral paste formulation of Ivermectin PhEur. For the treatment and control of small redworms (adult and immature), large redworms - adult and 4th larval (arterial), pinworms, lungworms, ascarids, stomach worms, intestinal threadworms, cutaneous worms and bots. Bimectin kills the adult and 4th larval stages of most of the important internal parasites. At the recommended rate Bimectin can be used with complete confidence in foals, mares, ponies and horses. Mares may be treated at any stage of pregnancy and the fertility of stallions that have been treated has not been affected.